We don’t know if Damian Campbell makes $382,000 a year from his Facebook campaign. We do know his ad and web landing page, shown here, are pretty ugly, with enough disparate font treatments to send Edward Tufte into therapy. 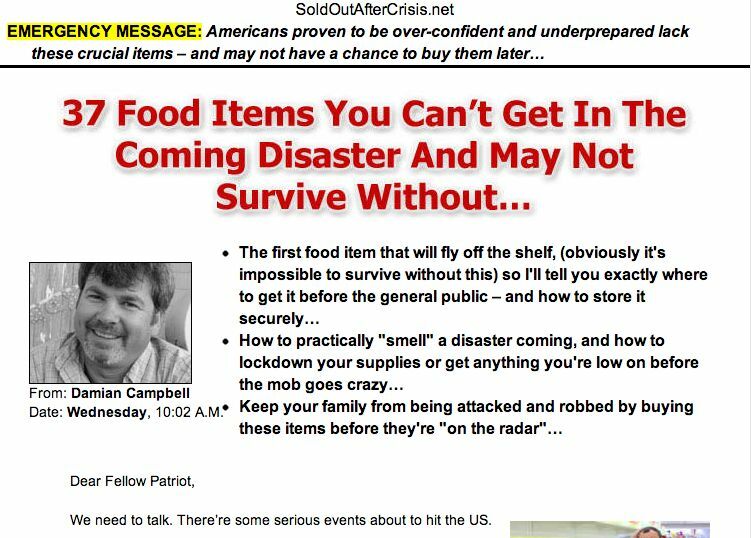 But what Damian has going for him is one of the most brilliantly well-written conversion pages we’ve ever seen — in this case, targeting patriotic survivalists for the coming apocalypse — and it’s likely he will make hundreds of thousands of dollars. So let’s break this little campaign down, looking outside in. 1. Damian is running ads inside Facebook. These can be purchased at a low cost per click, say, $1.25 for each person who clicks through to his conversion webpage. The “cost per click” buy is important, because he only pays if someone takes action on his ads. 2. Next comes pricing. 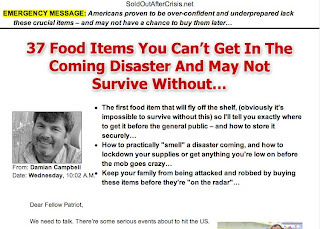 Damian is selling a CD-print package with tips for buying the right foodstuffs to survive any coming emergency. We’ll be generous and assume the total printing and shipping cost of this package is $4.00 per unit. 3. Damian sells the total package for $49.97, discounted from some high artificial reference price. So at an estimated $4.00 for production and stuffing envelopes, he clears $45.97 per order. 4. Now, let’s back out the estimated Facebook marketing costs. If each click costs $1.25, and Damian gets 3.50% of visitors to his web page to convert, that’s a $35.71 marketing cost per order — for a nice $10.26 profit per order. If Damian can boost conversion rates to 4% via clever copy (and he has a lot of clever copy), the marketing cost per order falls to $31.25. $45.97 inbound after production costs minus $31.25 in Facebook ad costs equals a whopping $14.72 profit per order. 5. Now consider how big Facebook is. More than a billion users, many of them U.S. citizens upset with the government and fearing the world is about to end. If Damian sells 500 booklet-CDs per week, his profits — not revenue, profits! — run to $7,360 per week or $382,720 per year. All this takes is a little Facebook ad, which can be tested at tiny budgets until the economics are proved to work, and a landing page that can achieve 4% conversion from visitor to buyer. The Mayans may have predicted the world will end in 2012, but we bet they didn’t see how social media ads could help authors make hundreds of thousands of dollars. There’s always a crisis coming. We bet Damian’s site SoldOutAfterCrisis.net will do even better in 2013.